Profile: DataCom Design provided comprehensive design for all the low voltage systems at the Methodist Willowbrook Hospital's 473,000 SF North Pavilion, doubling the size of the hospital. It is the hospital's third expansion project, bringing the bed count to 241, with the capacity to grow to 349 beds in the future. 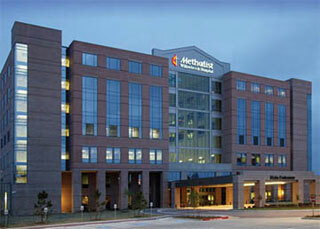 The redundant Data Center is the main Data Center for the Hospital Expansion, and includes a fully capable backup site for the Methodist Hospital's downtown Data Center. The new Data Center houses the core switch/routers, server farms, PAC servers, and support equipment. The Data Center supports approximately 50 cabinets with a high-density load factor. There are two 750 kVA/600 kW UPS units, and A&B power distribution units to the cabinets, as well as a standby generator for long term outages. Services: Our Data Center expert designed the new facility based upon the Uptime Institute's Tier Performance Standards for Site Infrastructure Performance.